Governor Cuomo orders MTA to plan for a possible “orderly suspension” of commuter services for Hurricane Sandy. New York Governor Andrew M. Cuomo has ordered the Metropolitan Transportation Authority (MTA) to plan for a possible “orderly suspension” of commuter services on the largest public transportation system in America in the face of what meteorologists are calling a "superstorm." A coastal flood warning in New York is already in effect until Tuesday at 3:00 p.m. 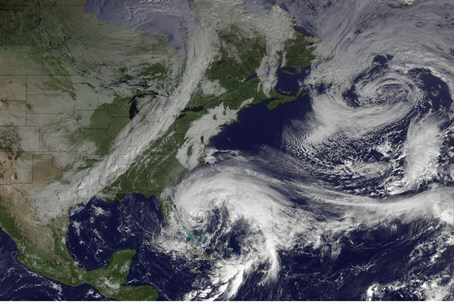 Residents up and down the Eastern Seaboard have scrambled to stock up on supplies and secure homes as Hurricane Sandy lumbered north after leaving dozens dead in the Caribbean, AFP reported. The so-called "Frankenstorm" was expected to make landfall somewhere between Virginia and Massachusetts early Tuesday, possibly causing chaos during the frenzied last days of campaigning before the November 6 presidential elections. If Hurricane Sandy continues her projected path, a final decision to shut down all subway, bus and commuter rail lines in metro New York will be made by midday Sunday EST, Cuomo's office said. MTA chairman and CEO Joseph J. Lhota had already told reporters at a news conference Saturday the time required for a shutdown could take up to eight hours. The process must begin hours in advance of the storm’s arrival, as thousands of rail cars, subway cars and buses must be pulled from service and stored safely, he explained. To avoid damage from the impending hurricane, crews might have to remove gates at railroad crossings, Lhota added. The MTA Hurricane Plan call for suspension of service if dangerous, sustained winds reach 39 miles per hour (mph) or above, or storm surges of 4 to 8 feet reach the area. Likewise, all bridges will close to traffic if winds reach 60 mph or above. Lhota urged New Yorkers to do their best to get to wherever they need to be by 7:00 p.m. Sunday evening. The projected last trains for Metro North and the Long Island Railroad would make their final runs at that hour. “There's no guarantee of service after that,” he said. If the city goes into “public transit suspension” mode, Grand Central Station terminal – including its shops, restaurants, and kiosks – will close. The Access-A-Ride transit service will stop accepting requests at noon, and the final return trips will end at 5:00 p.m.